After four years of Calligraphy of the Witch being out of print, the paperback edition has just been released by Arte Público Press. I'm so happy the book is available again. 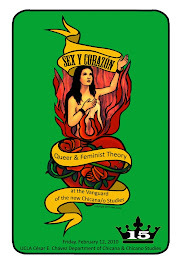 When the hardback first edition was released by St. Martin's Press in the Fall of 2007, I had just started Chairing the César Chávez Department of Chicana/o Studies at UCLA. 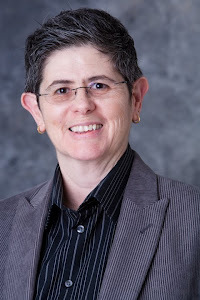 Administrative work completely absorbed all of my time and energy for three years, and I wasn't able to do the book justice, unlike the success I had with Desert Blood, which I was able to promote widely. 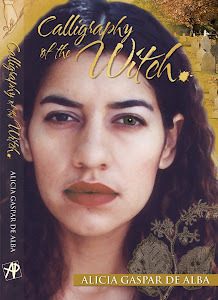 Now, Arte Público Press has released the paperback edition of Calligraphy of the Witch, sporting a brand new cover designed by my darling wife, Alma Lopez. Alma is also responsible for this gorgeous book trailer. You can order the book through my website: www.aliciagaspardealba.net, or wherever books are sold. The new cover features performer/musician Lysa Flores as the main character, Concepción Benavídez. Special thanks to Adelina Anthony for performing the part of Concepción's daughter, Hanna Jeremiah, in the book trailer.